This little blurb ran through my FB feed this morning and spurred something in me. What is the difference between shelters and rescues and really, it should have included animal control. 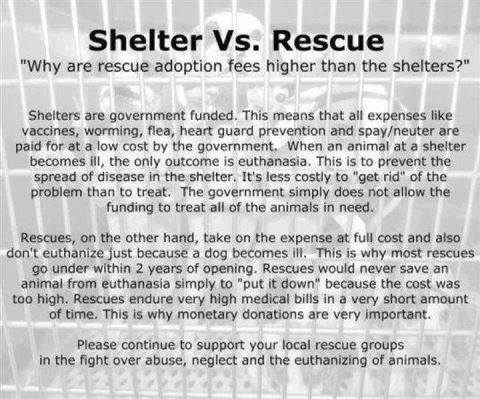 To be truthful the blurb seems to make the assumption that all shelters are government run, but that is not the case. There are thousands of private 501(c)3 shelters out there. Just as there are thousands of private rescues who foster cats and dogs in individual homes. So, where should you go for your next dog or cat? Personally, I have always looked to petfinder.com as my map to the right place. You can search for the animal you want simply by putting in what you want and where you live. Petfinder as well as adoptapet.com run databases of ONLY rescue animals. In seconds, you will see so many dogs needing homes and from there you can pick the ones who seem to touch your heart and you can either go to the shelters they are at or contact the rescues they are in. But, then what? It is true dogs at animal control (government run shelters) will have much lower adoption fees. Typically under $100 and all their vaccines, microchip and spay/neuter is included. I worked at AC for awhile, so I am happy to share a few things. Personally, my heart breaks a little more for animals in government run facilities. The employees are often employees who don’t care if they work at AC or for Streets and Sanitation or for the Mayor. They needed a job and they got one. It is true that the government is FAR less likely to spend any extra money on a dog needing vet care. So, if there are broken bones or cancer or a continual viral infection, unless a rescue comes in to pull the dog, AC will put it down. The thing that people have to remember is it was never the dog’s choice to go to AC. Either they got lost and were never reunited with their families or their families brought them there for a myriad of reasons. Typically they are: the family had a baby, the family was moving, the family was getting a divorce, someone was allergic. Rarely are dogs at AC because they are bad dogs or misfits or “have baggage.” REALLY AWESOME dogs are at animal controls across the country. Purebreds, puppies, you name it. I highly recommend checking them out. Shelters and rescues have their own benefits. When you adopt from them they tend to really know the dog you are interested in. USUALLY, the people who work/volunteer at rescues and shelters WANT to be there because they love animals, so when you ask them about a specific dog, they have lots to share. They tend to be, personally, invested in that dog and only want to see a positive, lifelong outcome. If you go with a breed specific rescue, they are going to know a lot about that breed and be able to tell you if that breed fits with your lifestyle. It is true that most private rescue and shelter adoption fees are high. They can be anywhere from $200-over $500. However, that always includes vaccines, microchips, and spay/neuter. Depending on the dog’s behavior, that also might include training and/or additional medical treatment. Unlike animal control, rescues and shelters are willing to invest a lot of money in a dog just to see it live the life it deserves. They will take it to training, get it surgery, etc… While not every dog needs those things, by charging a higher adoption fee for all dogs, they are able to give services to the ones who need it. Animals rescue or not – we all have to run on budgets. Here is where I put in my sly commentary… I am often irritated by people who roll their eyes at adoption fees, looking at me like rescue dogs should be free or something. Yet, those same people and many others will walk into a pet store and buy a puppy for over $1000. That same puppy will then need a $300-500 spay/neuter surgery, a $50 microchip, and over $100 in vaccines. I always tell people, “No dog is free.” Even if you get a free dog, one day you will have to spend money on vaccines or surgery or illness – not to even mention food, treats, and medicine. As for AC, shelters or rescue…there are fantastic dogs at all of them. So many dogs who never chose to be abandoned or lost or unwanted. The important decision is to ADOPT. 1.5 million dogs will be euthanized this year, wouldn’t you like to know YOU were solely responsible for changing that by at least 1. This entry was posted in Uncategorized on October 29, 2015 by sheltertails5839. I had a moment yesterday. 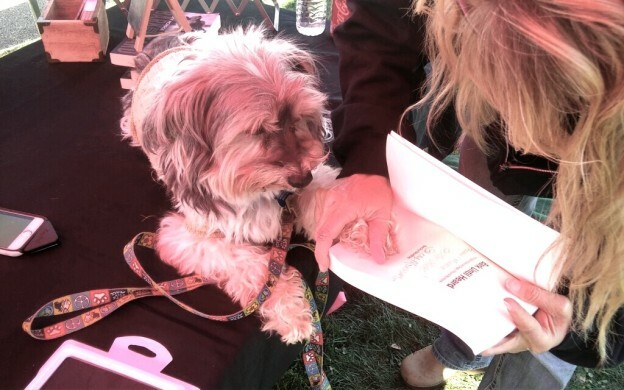 The Puppy Mill Project was at an event, Hiking for Hounds, and I was selling my book, Bark Until Heard. Angie had this great idea that Thorp should pawtagraph books, so I finally got an ink pad, and, for the first time, Thorp was signing books, too. Later in the day, Christine photographed Thorp signing the book and texted it to me. When I opened it and looked at the photo, my heart melted. It was perfect. I thought about the picture the whole ride home. I can re-call 7 years ago, March 12, like it was yesterday. The smells, the noise, and the pure heartache remain amazingly vivid for me. I also remember the exact feeling I had in my soul when I decided in an instant that I would rescue Thorp and write a book about him. I am by no means a religious person. I don’t go to church or read the Bible, but I can attest that the feeling I had that day had to be driven by something much larger than me. I remember sitting in the crappy bleachers, looking around at what seemed like Hell to me, and being overcome with this idea that I could do something to make a difference. I knew writing the book about Thorp was something I had to do. It was a difficult road, no doubt. The writing wasn’t always easy, but the entire journey was challenging. Going to two more auctions nearly did me in – emotionally. Being surrounded by broken spirited dogs is beyond gut wrenching. The pain and the anger and helplessness were hard to wrap my head around at times. The fighting and the pleading with legislators took a toll. Every beat of my heart was wrapped up in the emotional roller coaster ride I spent 7 years on. Yet, I never once chose to give-up. The book is out and the reviews have been great. The last few months have been surreal to say the least. I am still attempting to take it all in. Seeing Thorp making his paw print under the words “Bark Until Heard” not only made it all very real, but made me realize how important it is to listen to your soul and to have faith in things bigger than yourself. I certainly didn’t know the extent of the journey when I felt the desire to save Thorp and pursue writing his story. I only knew it had to be done. Now, I find myself at these wonderful dog events being able to share my story and raise the awareness of puppy mills. I am fortunate to be surrounded by people who are volunteering their time to rescue dogs and improve their lives. 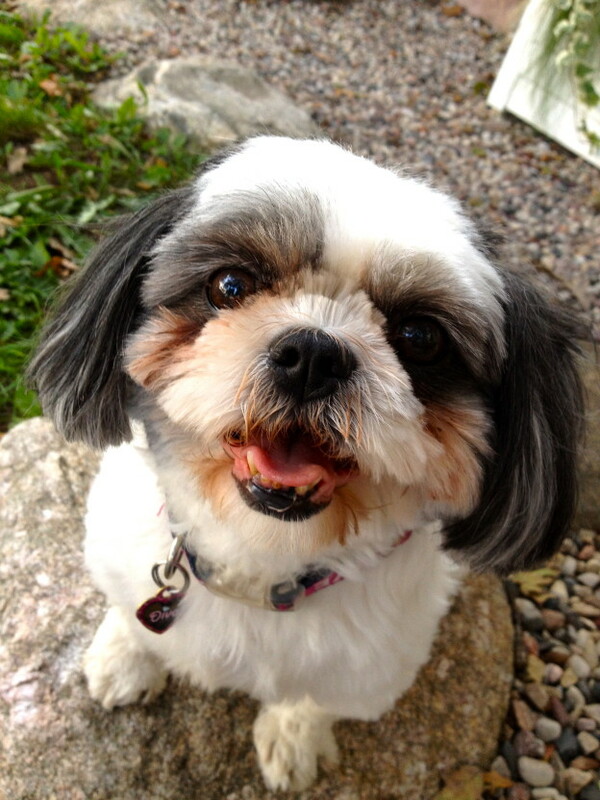 I get to meet adopters whose lives have been changed by their rescue dogs. I spend time petting dogs of every single kind of breed or combination. My heart is full. It isn’t and it never was about “writing a book.” It has always been about so much more. I am not a life coach, but I just want to encourage others to follow what they feel in their heart, to listen to their soul when it speaks. Have faith and believe in your dreams because not only are they possible, the journey they take you on is far better than you ever imagined. Bark Until Heard is my first book. It can be purchased on amazon or signed copies can be bought on my web-site beckymonroe.com. This entry was posted in Uncategorized and tagged dogs, dreams, puppy-mills, writing on October 19, 2015 by sheltertails5839. Last weekend we headed up to our cabin in Wisconsin for the weekend. As usual, Penelope, our Shih Tzu/rescued mill dog, sat on my lap in the front seat while Thorp and Jack slept peacefully in the back. Penelope gets shotgun because she gets car sick. We have found that letting her sit in the front seat with the A/C blowing on her alleviates it. Secretly, I think she is over the carsick thing, but I can’t imagine not having her sit on my lap. It is unfathomable at first, but maybe it is possible. Why else could it be so hard to save them all? If everyone felt like I do, surely things would be different by now. As I let my hand softly stroke Penelope’s coat and watched her rhythmic breathing, I paid close attention to that feeling I have in my heart. That feeling that makes me feel whole when I hold my dog close. That feeling that makes my soul feel at peace. When I hold an animal, all is right with the world. I feel connected and loved and in the moment. Could it be that not everyone has had the same experience with animals? Are there people who don’t feel that connectedness? People who don’t feel that warmth in their hearts when they pet a dog? For the first time in my life, I felt sadness for people like that. All of the puppy-millers, the abusers, the neglecters… was that why they chose to be so awful to dogs? Were they really not given the gift of connecting to animals on such a higher level? Did they really not ever have “that” moment with a pet? I can never excuse their actions nor stop condemning them for their behaviors. I will never cease advocating for animals and expecting better treatment for them. However, to begin to acknowledge or at least theorize that there are people who don’t spiritually connect to animals like I do, allows me to better understand the world and why it is taking so long to make things better for the animals. It also reminds me how fortunate I am. Sure there are days when being so connected to an animal hurts, but the benefits of loving an animal so selflessly, of feeling so unconditionally loved back. I cannot imagine my life without those feelings in it. I have never just seen a dog. I have always felt a soul looking back at me. This entry was posted in Uncategorized on October 14, 2015 by sheltertails5839.